Welcome to Mellow's Log Cabin. This blog's purpose is to supply information on a diversity of American southern music - ranging from country, blues, old-time and folk to R&B, rock'n'roll and rockabilly. I regularly present my research results about artists, labels, shows and also give guest writers a chance to publish their texts here on occasion. • Jack Turner recordings available here. • Update on Les Randall acetate. • Thanks to Bob more info on Bill Harris. Murray Nash's activities as an independent record producer in the late 1950s and early 1960s have been the subject on this blog several times. Another label that was operated by Nash was the small MusiCenter Records, which had at least six releases. He started this outlet in 1965 and ran it also from his Recording of Nashville studio that also housed his other labels such as Do-Ra-Me, Topic, Round-Up, and Cee Cee. The debut release was by Chuck Wiley and featured "Come Back Baby" b/w "Little Star, Little Star." 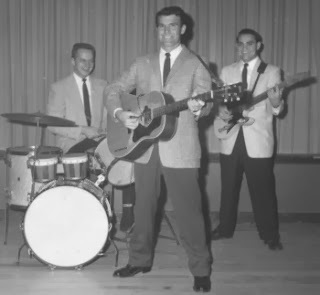 Curtis Hobock, a rock'n'roll singer from Tennessee, also cut two discs for MusiCenter. He also had two releases on Cee Cee, one of Nash's other labels. MusiCenter releases are easier to date because Nash used RCA's custom pressing service, thus a reliable indicator of the pressing year. Nash's account number at RCA was 692B, which also appeared on Country Music Nashville, another one of Nash's labels. MusiCenter lasted at least until 1966. Most of the known releases have Nash's "By-Nash of Nashville" listed as publisher. If anyone has more info on MusiCenter or can fill gaps in the discography, please feel free to contact me. Note: Geneva Hobock was Curtis Hobock's wife. The other composers listed on "One Heart'll Love You" were members of the Stardusters: Tommy Jones (ld gtr), Bobby Howell (dms), Howard Bates (bs), Richard Luther (pno). #3102- The Valiants, All Night Long b/w I'm Getting Tired Of You. #3104- Kenny Norton, To Know You b/w Oonie, Oonie, Yah, Yah, Yah. From the same period is another Murray Nash label named Country Music Nashville (same RCA custom account 692B). First release was Bob Roark (#2001).